Sackets Harbor, N.Y. - The Seaway Trail Foundation has announced the results of the economic impact survey of its War of 1812 Bicentennial theme quilt show held in March 2012 in Sackets Harbor, NY. The two-day event brought more than $67,000 into the local economy. The survey was conducted in partnership by the nonprofit tourism organization and the Jefferson Community College Hospitality and Tourism Program. 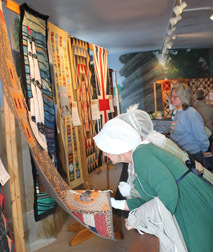 The Great Lakes Seaway Trail Discovery Center and two other historic sites in the village of Sackets Harbor hosted more than 1,000 visitors to see the 1812-stytle quilts made by quilters in 18 U.S. states and five Canadian provinces. Visitors to the show came from as far away as Los Angeles, Germany, and Australia. Twenty-five of the show&apos;s quilts will travel throughout the U.S. and Canada in 2012-2014 as part of a Great Lakes Seaway Trail War of 1812 educational exhibit. The Great Lakes Seaway Trail is a 518-mile-long National Scenic Byway along the freshwater shoreline of New York and Pennsylvania. Find more information online at http://www.seawaytrail.com/.